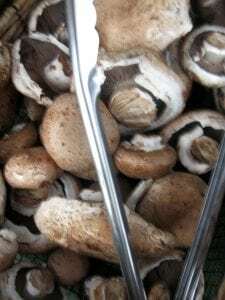 Although this awesomely autumnal dish calls for crimini mushrooms (Shamrock now has them), I wouldn’t hesitate to try it with shiitakes, portabellas (the full-grown version of crimini), any wild mushroom, or even delicate oyster mushrooms. You could also use any cheeses that strike your fancy as well as any type of greens. For a bolder flavor profile you could use a blue cheese and kale. In a heavy pot, bring 6 cups water and salt to a boil. Gradually stir in polenta, stirring quickly to avoid lumps. Turn heat to low. When water is completely absorbed, add another 1/2 cup of water and continue to stir occasionally. Continue adding water, 1/2 cup at a time, after each time water is absorbed by polenta. Continue to cook for at least 30 minutes, stirring occasionally. Stir in butter last. In a wide sauté pan over medium heat, heat olive oil. Add the onions and stir to coat them in oil. Season with salt and pepper to taste. Continue to cook over medium low heat until onions are golden and caramelized, stirring occasionally, about 20 minutes. Transfer onions to a bowl and set aside. Heat the remaining tablespoon of oil in the same pan. Add the mushrooms and garlic and cook until mushrooms release their liquid and then evaporates. Add spinach and stir together until spinach is just wilted. Return onions to pan and stir to combine. Spread the polenta on the bottom of a lightly oiled 9×13 baking dish. Arrange mushrooms, greens, and onions over the polenta. Dollop mounds of ricotta and slices of goat cheese over the vegetable mixture. Bake for 20 minutes until cheese is melted and soft. Sprinkle with fresh thyme leaves to serve. Don’t be intimidated by the polenta. I know a lot of people have never tried cooking it, but it really is simple as long as you make sure you get plain corn meal and not a corn meal mix that is actually meant for muffins. Once you try it, you’ll be hooked because it’s a great vehicle for a good tomato sauce and/or any type of vegetables or cheese. Cold leftover plain polenta is amazing sliced, fried and topped with syrup for breakfast! Don’t forget to check our recipe archive for more marvelous mushroom recipes.